Product prices and availability are accurate as of 2019-04-23 07:16:28 UTC and are subject to change. Any price and availability information displayed on http://www.amazon.com/ at the time of purchase will apply to the purchase of this product. A true tale of how an Egyptian born son can be educated to achieve honours in his chosen university studies, yet denied the right to turn them into a career. Every Egyptian child adopts at birth, its father’s nationality, so many find themselves a foreigner in his land of birth. Another law denies foreigners in Egypt, the right to work. With neighbouring Sudan in an ongoing civil war, this young man risks assassination if even visiting his father’s country, let alone wanting to reside and work. What can he do when even visa’s are denied Sudan’s citizens to any western country, simply fearing being ‘smothered’ by countless Sudanese wanting to flee the mayhem? In this case, a visiting westerner takes up the challenge of finding a way around this poor fellow’s political dilemma. I highly recommend reading A Soul Forsaken, which is a very sensitive and touching story. 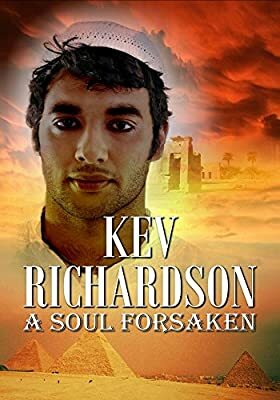 Kev Richardson, multi-published Historical writer brings us a tale of a young man considered a foreigner in his own birth country, without privileges or freedoms, that the average person would consider his birth right. I was emotionally drawn into the injustice of Ali el Hag’s situation. You too will fall in love with Ali’s struggle and determination to find a country willing to grant him the right to live a productive life. In A Soul Forsaken, Kev Richardson exposes yet another unique twist in his long list of personal experiences when travelling. At a History Seminar at the Cairo Museum, a chance meeting with a local father and son, his hero is exposed to an intriguing anomaly in humanitarian law. An Egyptian born son can be educated to achieve honours in his chosen university studies, yet denied the right to make it a career. This true tale is of a young man who by Egyptian law, must take his father’s nationality, making him a foreigner in his land of birth. Another law denies foreigners in Egypt, the right to work. Because his father’s country is in an ongoing civil war, the young man risks assassination if even visiting there, let alone wanting to reside and work. A visiting foreigner of a western country takes up the challenge of finding a way around the poor fellow’s political dilemma. Richardson, in yet another work of fine character studies, excels himself in untangling such a humane tangle.